The GT is a handsome looking hatch. Hyundai has done a decent job designing it without falling into the hot-hatch craze of flamboyancy, and can still proudly wear the GT badging without criticism. We like the smiling chrome grille, black body accents, and the unique chrome headlamp design. The GT has received a slight refresher for 2014 that adds a bit of pizazz and charisma. Dressed to impress in Monaco White, our GT featured new 17” alloys with chrome inserts and snazzy new LED taillights as part of an optional Style Package. Most of the new work has been taken to under the hood, where the ‘GT’ badge starts to earn its kibble. In lieu of the old 1.8-liter is now a new 2.0-liter direct injection four-banger that pumps out a whopping 173-hp and 154 lb-ft of torque. That’s 19 more horses and 24 more torques than before. This new engine is still available through a six-speed automatic, and is now available in a six-speed manual – like our tester. This is where the Elantra GT can now properly take on the Ford Focus and Mazda 3. This new 2.0-liter works quite well with the GT. Power delivery to the front wheels is, to say the least, adequate. No drag races will be won here as 0-60 will barely touch 8 seconds – depending on how quickly you can change gears. The GT is a little rascal when it comes to driving – we like cars like this. With a quick release of the clutch you can lay down some rubber maxing out the rpms to 6,500. The six-speed transmission is excellent, gear changes have a smooth transition and the clutch has a creamy feel to it – this makes it easy to live with and drive every day. We did come across something rather intriguing when scoping through our testers spec sheet. As part of the $2,550 Style Package, it included a Sport-Tuned Suspension. Usually it’s easy to tell right off when a car has a sport suspension based off its firm and uncomfortable ride… but we didn’t get this feeling with the GT. The suspension is rather smooth and forgiving; bumps are noticeable, but not back breaking. Where you start to notice the sport feel is when you engage the “Sport” setting for steering maneuvering, this allows the GT to be tossed around more aggressively for a more agile feel. You won’t be cocking a wheel when you make that left hand turn at the light, but will have a bit of fun doing it. Now, if that’s not quite your speed, you can adjust your steering comfort settings to “Normal” or “Comfort” mode making things smoother and lighter. At that rate you are bound to reach the Elantra’s fuel efficiency EPA of 24 mpg city and 34 mpg highway. Even with all our thrashings we were left with a decent range of 310 miles on regular fuel, averaging 28 mpg city and 36 mpg highway – much better than the EPA. Hyundai has done a great job with the Elantra’s interior. Our tested Elantra arrived very elegantly with a beige leather interior and two tone beige and charcoal dashboard configuration. When it came to the options list, we weren’t shy with the checkmarks opting for the $2,550 Style Package that included the 17” wheels, Sport-Tuned Suspension, Leather Seating, Power Driver Seat, Aluminum Pedals, Proximity Key with Push Button Start, LED taillights, Hyundai’s Blue Link, & Leather Wrapped Steering Wheel with Shift Knob. We also opted for the $3,250 Tech Package giving Navigation with Rearview Camera, Automatic Headlights, Dual Automatic Climate, and a Panoramic Sunroof. Throw in $125 Carpeted Floor Mats and we are good to go. The interior of the GT is relatively comfortable for a compact sedan. The power adjustable driver seat has a good range of motion for finding the perfect position and both driver and passenger have heated seats. Because the GT is a hatchback, rear passengers won’t fuss over the headroom issues, leg room is small, but average for a compact car. The overall agronomics and style of the GT’s interior is very well laid out. We like smooth three-dimensional swooping dash lines contrasted by silver trim and the piano black center stack accents. The leather wrapped steering wheel has a good grip and the steering wheel controls creates an ease of access to your entertainment. 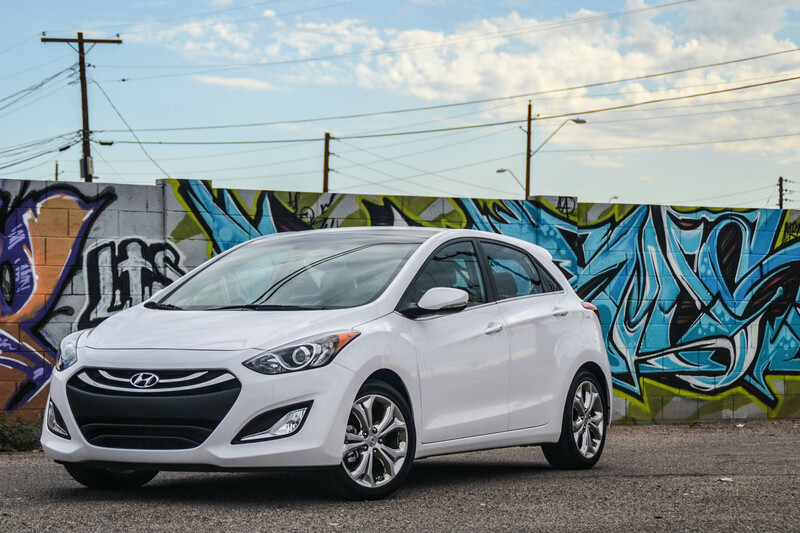 Since our Elantra GT was equipped with the Tech Package; Navigation was included. Now, we have always found ourselves fond of Hyundai’s Nav and voice activation system, but when it came to the Elantra… we like to know what went wrong? The system itself is a good system; menus and options are simple to access and the Navigation has an excellent display. The problems started with the voice activation software, it was reminiscent of first generation setups – voice commands could not be recognize no matter which way its approached. The back-up camera, which pops out of the Hyundai emblem in the back (how cool is that), is quite blurry and occasionally appears to be black and white, even though its not. Lastly, it is a rather annoyance to press the “I Agree” button every time you want to access the Navigation. We would say, save the $3,250, but since the Panoramic Moonrof is part of the Tech Package, and we obviously like the Panoramic Moonroof, so it might be worth living with the Nav and voice issues. The Elantra that was once known as a cheap Korean box on wheels is long gone and left in the history of Wikipedia. The new generation offers up touches of luxury that you don’t even find in expensive luxury sedans. With the addition of the 2.0-liter engine, Hyundai notches the GT into a new playing field of enjoyment – something the GT was in dire need of.